->GITIS Best Quality Napa Leather with Strong Polyester Inner Lining & High Tech RFID Blocking Capabilities. 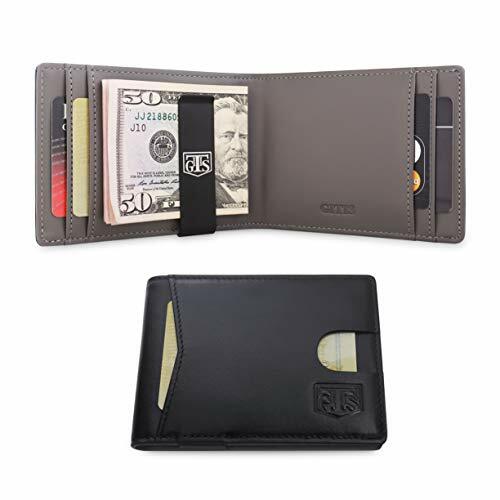 This wallet is carefully handcrafted from premium Napa leather with integrated advanced RFID blocking material to protect your personal credit card Information. This wallet is packaged with a stylish gift box that would make it the perfect gift for you father, husband, brother, boyfriend or friends. HIGH-END Quality Material: GITIS men's Leather Wallet is crafted from the finest grain Napa leather and has 240D polyester lining plus RFID BLOCKING MATERIAL. We use Eco- friendly glue vice non-environmental friendly glue that will not damage your skin, although this adds cost we are dedicated to producinga quality eco-friendly product. INTEGRATED MONEY CLIP: The metal money clip allows you to clip several bills inside your wallet. When you hold this wallet in your hand you'll see and feel the difference between it and other lower quality wallets. FUNCTIONAL & SLIM: GITIS'S wallet offers 6 card pockets: 1 easy access front pocket and 5 inner pockets. The slim wallet design is ideal for carrying business cards, credit and debt cards, bills, etc. Packaged in a stylish gift box,It is the perfect gift for your father, husband, brother, or special friend. RFID BLOCKING - this Napa leather wallet is quipped with advanced RFID blocking material, with approved 10 - 3000 MHz blocking for credit cards, debit cards, driver license and ID cards that protects the valuable information stored on RFID chips from unauthorized scans; but,PLEASE BE AWARE that some ID badges, access cards, and hotel room cards operate in the 125 KHz range and CAN NOT be blocked by our RFID material. NO HASSLE MONEY BACK GUARANTEE - We know you'll love our wallet as much as we do; but, if for any reason you're not 100% SATISFIED,let us know and our customer service team will make things right: full refund or a free replacement, whichever you prefer. If you have any questions about this product by GITIS, contact us by completing and submitting the form below. If you are looking for a specif part number, please include it with your message.